Botanical gardens are a hallmark of civilization. They are closely, related to man's effort to develop, utilize and protect plant resources. China is a nation with rich plant resources. A total of 30,000 higher plants grow on its land of 9.6 million square kilometers. China is also a ancient civilization. As early as 2,800 BC, the legendary Divine Peasant opened a nursery of medicinal herbs that is regarded as the predecessor of all botanical gardens in the world. 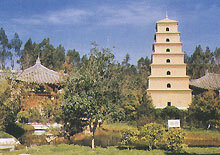 Modern botanical gardens occurred in China in the beginning of the 20th century. Today, China has established more than 120 botanical gardens, thereby making major contributions to the study, protection, development, and utilization of the country's plant resources. They have also played a major role in educating the public in the need to protect plants.